Review: Let’s Get Fancy Together! 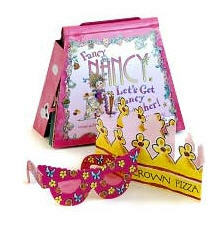 So my daughter loves the character Fancy Nancy. She also loves Dorothy from the Wizard of Oz (hence the Ruby Red slippers in this photo). On a trip to the bookstore we purchased Let’s Get Fancy Together! by Jane O’Connor and Robin Preiss Glasser. I had no idea it had all this “stuff” in it. It’s one of those books that has lots of flaps and things to look out. So when my daughter plopped herself down to read it and then showed up all decked out in looking, well… fancy, I had to take a picture quickly. The camera next to me was my point and shoot and not my Nikon but I think it managed to capture the moment. She has had the most fun with this book. Actually, she enjoys all the Fancy Nancy books no matter what form they are in. We highly recommend them! Previous PostWanna Be Scared?Next PostHappy Valentine’s Day! That picture is priceless. She is absolutely adorable. Ti – she is so darned priceless, it’s amazing! Oh my gosh! She is so cute! 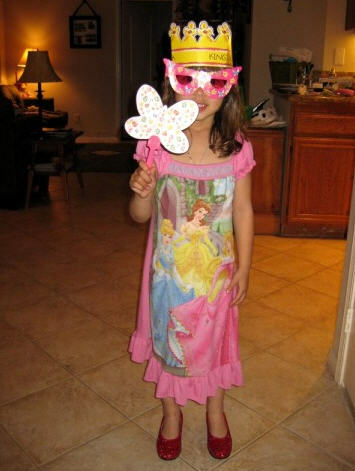 I used to love to play dress up, which I also passed on to my daughter. She is now 20 and still “Dressing up”. What a great idea to include dress up thing with a book! Love it, she’s adorable!! Isn’t it fun to have little girls in the house! Great picture!